Good Bones: Part II Jane Bowne Haines, a Quaker for Feminine Education	« John Bartram Lives! Over 100 years ago the Ambler Campus of Temple University opened its doors as the Pennsylvania School of Horticulture for Women. It was founded by Jane Bowne Haines to give women the educational opportunity to aspire to more than domesticity and careers in cleaning, sewing, cooking, and child-rearing. A historic marker along Camp Meeting Road next to the campus defines its importance in female studies: “The school was the first in the nation to educated women for careers in horticulture and agriculture. It was founded on this site in 1910 by Jane Bowne Haines and a “congress of women.” Three years later the Woman’s National Farm and the Garden Association originated here at a meeting sponsored by the school. During WWI and WWII, PSHW trained women to grow and preserve food for the war effort. In 1958 PSHW merged with Temple University. Haines was descended from a Quaker family. An ancestor, Caspar Wistar, was a professor at the University of Pennsylvania and an amateur botanist. We remember him today as the man after whom the Wisteriawas named. Ms. Haines inherited his spark of botanical interest. They were people on the long and interconnected family tree of Quaker in Horticulture in Philadelphia. It is a very small world when God is in the details. The pergola at the end of the lawn, terrace and borders is undergoing renovation in 2012. 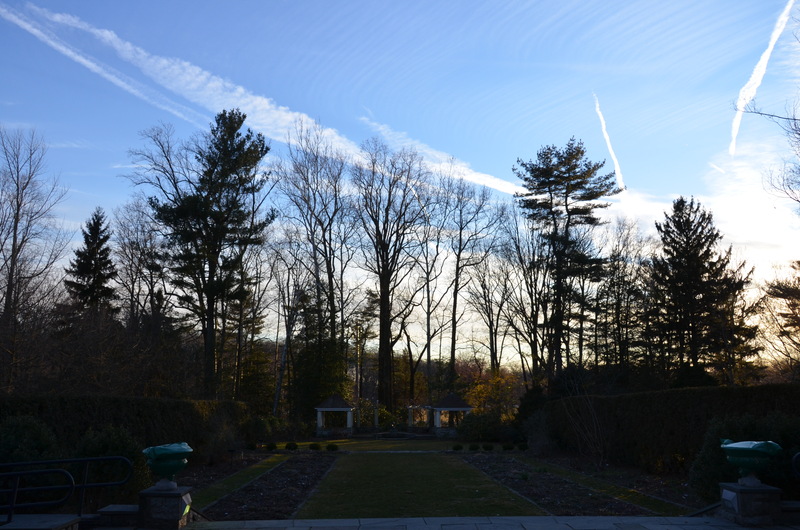 The campus is home to a wonderful collection of trees, shrubs, display and educational gardens. 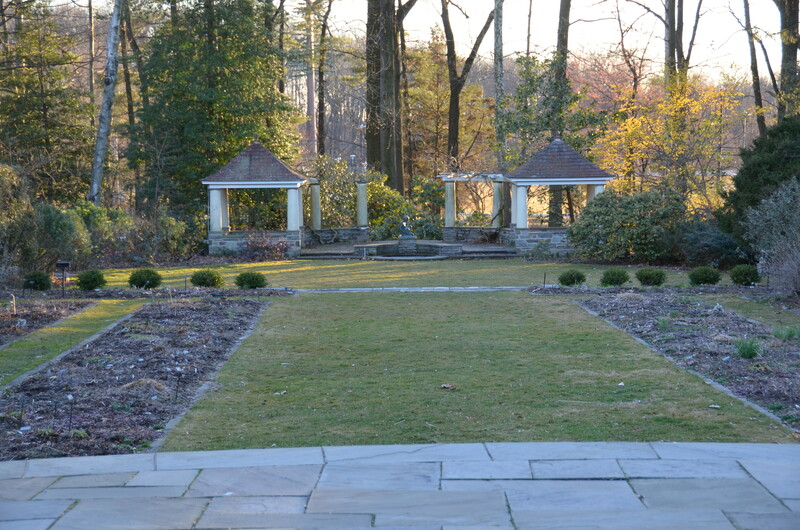 The centerpiece is a terraced lawn and borders along with a woodland designed by the noted early landscape designer and only female charter member of the newly organized American Society of Landscape Architects : Beatrix Farrand. Her Cadwalader antecedents were also part of the strong Quaker heritage of Philadelphia. Her cousin was Edith Wharton, another noted and extremely literate gardener. 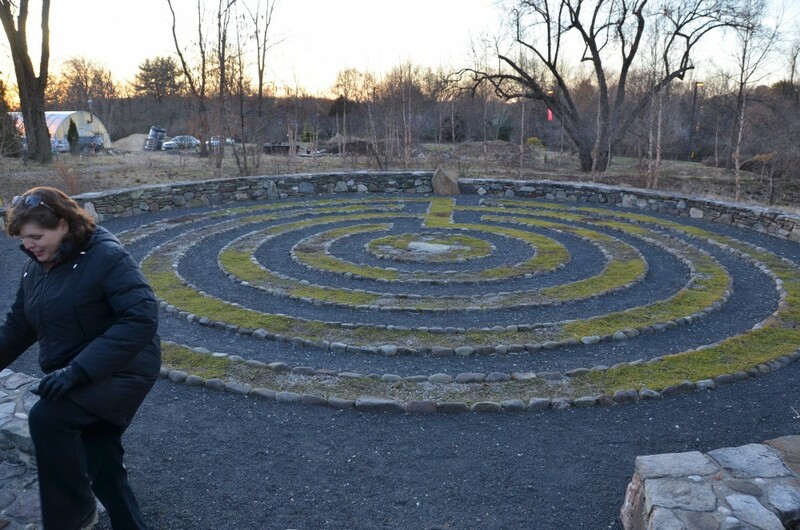 The Labyrinth is a very spiritual space. Everyone should be required to actively walk one once in every life. My day in Temple’s woods ended at the spiritual center of the space. 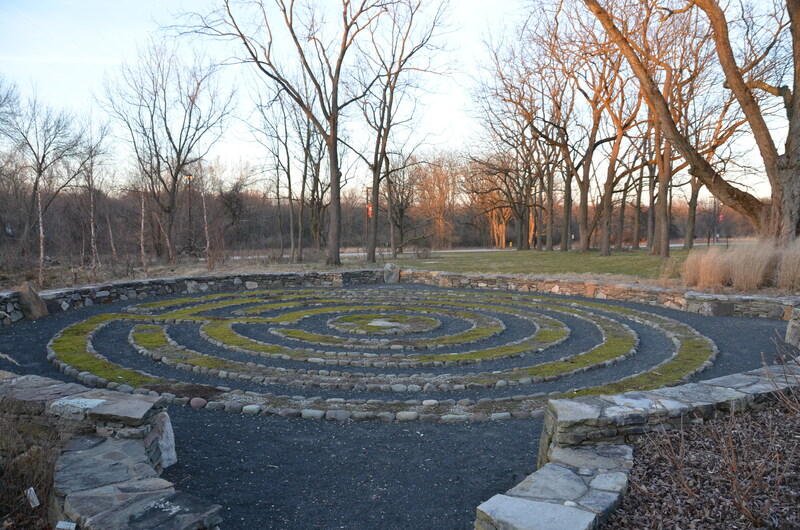 A labyrinth has gravel paths edged with natural stone boulders. Surrounding the “Road to Jerusalem” is a very Celtic ring of stones. There were several monolithic menhirs standing as sentinels around the space. The bones of this garden are reminders of our own medieval Christian religion and a far earlier and primitive Druidic culture. It was a holy way to end the tour. Our mentor and guide for the afternoon was Eva Monheim. You can catch her spirit in the movement round the edge of this picture. She is a friend of long-standing with a sense of the spirituality of life. She shares her divine spark with the students who call her teacher. One of the last great Quaker plantswomen! Agreed. I had known about Temple. But who knows about the Quaker connections except other Quakers? There’s a lot more to the story and/or history. OR Herstory. Looking forward to your “appearance” at John Bartram’s Garden, Saturday July 28 at 8am! The Master Gardeners are going to love this! Can’t wait! Neither can I! I want to see who, if anyone, represents the garden. It’s a changing dynamic right now. Lynn, it was a wonderful weekend for us. We had dinner with the committee on Saturday night and then toured Frick Museums in the morning of our return drive. I still had a lot of work to do on three presentations that I gave yesterday and today. John spoke to the Upper Moreland Historic Association and I did the keynote and a lecture for the New Jersey State Landscape Design School. And work has been hectic. I have many things and dozens of photos to write posts about. Life is good! We must talk music and a garden’s inspiration.